We woke in the gopher site at 6:00 AM to a blaring car alarm followed by the horns of a passing freight train. With tracks running less than 50 feet from the campsite, we were woken several times during the night by trains. The car alarm topped off a bad night’s sleep and we figured we might as well just get up and start the day. As we ate breakfast and drank coffee in the shade at a picnic table next to the gopher site, I checked the maps again and determined our next campsite, Leo Carrillo State Beach, was a little over 47 miles away. With stops, we average about 10 miles and hour, so I figured 47 miles would take us about 5 hours. Since it was so early, we had the luxury of a slow roll out. We said goodbye to Henry and Danielle before they packed up and left, they were headed to town for breakfast. They planned to camp at Leo Carrillo too so we knew we’d see them again. We eventually packed up and got on the road. And after a brief stop in town for second breakfast and coffee, we started pedaling toward our destination. The bike route meandered through town and eventually joined busy Hwy 1. It was Sunday, in the middle of a heat wave and by the time we got rolling, beach traffic was hopping: lots of cars and large trucks towing RVs and not a lot of space for bikes on the shoulder. Again, we steeled ourselves for some unpleasant riding. If I was talking to you in person, I might just throw in a few F-bombs to describe the next stretch of road. But this is a family blog so I won’t. Let’s just say it was bad, really, really F-bomb bad! The route featured narrow “bike lanes” painted over horrible pavement, lots of road debris and overgrown shrubs obstructing the path, heavy traffic, enormous RVs squeezing by the too-close-to-traffic bike lane, beach traffic, distracted drivers looking for parking near the beach, narrow shoulders, and much much more. We thought we’d seen the worst of it just outside of Carpinteria. 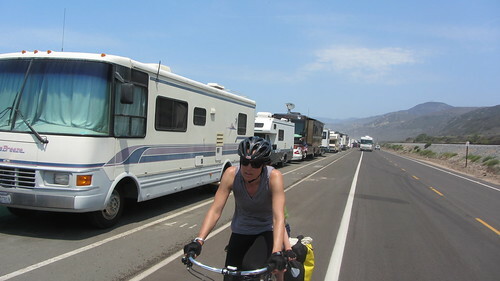 But as we approached Ventura, we realized we were wrong and noticed a stream of RVs in the distance. The narrow Hwy shoulder was strewn with hundreds of parked RVs that stretched on for miles. 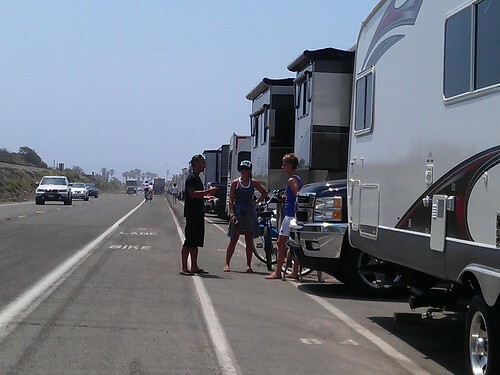 As we approached the RV hoard, we realized it was not a hazy mirage, but a popular surf beach and apparently RV mecca! Our jaws dropped at the sight and remained permanently gaping until we left the area. So we began a discussion about surf culture instead. We figured this must have been a popular surf beach in the 1960s and 70s too. But back then, the vehicles parked along the highway were most likely tiny-by-comparison VW buses and ratty station wagons. In 2013, they are $300,000 to $500, 000 luxury RVs. At one point I glanced over and noticed a super fancy RV featuring a flip-out deck that opened off the back of the vehicle. A couple was lounging on “the deck” in some sort of rattan chairs, sipping cocktails and enjoying the surf scene. Because we’re backpackers and bike tourists, who enjoy simpler pleasures and modes of travel, this scene was beyond surreal. We felt so small, vulnerable and foreign riding though the area on a bike. I can in no way relate to these people or understand why they’d think that “camping” on the highway with 450 other large vehicles is fun. To be fair, I’m sure if they noticed us on our slow, pannier-laden bikes, they would think us equally foreign. Because the “bike path” was squeezed between RV parking and traffic lanes, we were nervous about getting run over or doored as we pedaled past the giant vehicles. So we kept our heads up, tried not to rubber neck too much and rode defensively through the area. As we approached Ventura, I thought about Yvon Chouinard and the origins of Patagonia. I’d read his book a few years prior and it left me with a completely different picture of surf culture and Ventura in my imagination. I thought Ventura would be mellow, serene and beautiful. Maybe it once was, but not anymore. It’s not a sleepy little beach town, but a sprawling, traffic clogged metropolis like so many other So Cal beach towns. I’m hoping we missed the best parts, as we just followed the bike route through town and didn’t explore much. Maybe Ventura has redeeming charm somewhere that we missed? After the sod farms, the route skirted another military base, Point Mugu, a Naval base in Ventura County. Before we left on our trip, my dad had studied our maps and route and located Point Mugu on the route. Dad was a Navy jet pilot and officer in the 1960s . Looking at the maps sparked a memory and dad asked if he’d told us the story about Point Mugu. I couldn’t remember the story so he sat in our living room and recounted it again. In the late 60’s dads F4 almost ran out of fuel in Point Mugu. He was flying off an aircraft carrier in the Pacific close to Point Mugu when he noticed the plane was low on fuel. So he radioed air traffic control at Point Mugu to ask for clearance to land. Since he didn’t think he had enough fuel to fly around and land in the proper direction on the airstrip, he asked if he could land the wrong way. Air traffic control insisted he fly around and land the correct direction. And dad insisted he didn’t think he had enough fuel to fly around, he needed to land now, in the wrong direction. Eventually dad was cleared to land in the wrong direction. And when the ground crew checked the plane after he landed, they said, “Sir, your airplane is completely out of fuel.” If he hadn’t been cleared to land, he would have run out of fuel and crashed. 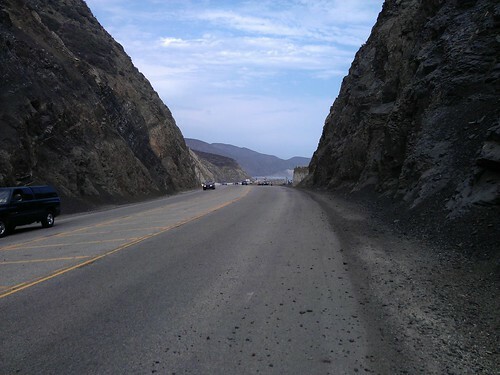 I recounted the story to the kids (again) as we pedaled toward Point Mugu. We were still battling a raging headwind and I was trying to keep our minds off the wind and our pain. When we finally arrived, we saw a bunch of planes on display and decided to go check them out. Turns out Point Mugu has a “Missile Park” and not only did it feature planes, but also various missiles. Our son, who is into planes and missiles and other 10-year-old-boy stuff, noticed they had a F4 on display, DDs plane! So we all posed for photos in front of it. After checking out all the planes and missiles, we started pedaling again. We still had 15 miles to pedal before we reached the campground. And the F-bomb wind continued to rage as we pedaled toward the ocean. Once at the ocean, we were met with another beach parking scene. We’d already endured one stretch of Hwy 1 laden with parked cars and RVs that day, I guess we could handle another. At this point we were all pretty tired from the stress and the headwind and were anxious to stop pedaling and camp. But we were also pretty hungry. We’d seen a restaurant symbol on our Adventure Cycling map and thought if the symbol corresponded with a restaurant that looked promising, we’d stop for dinner. As we approached the point on the map, we could see the building in the distance. We also noticed hundreds of motorcycles parked outside the restaurant and along the highway. I was up for checking it out, but my stoker would have nothing of it. He had no interest in eating at a “biker bar”. Too tired to care after a stressful and tiring day on the bikes, we decided we were all content with scrounging food from our panniers once we arrived at camp. We pressed on toward the campsite at Leo Carrillo State Beach and skipped dinner at the biker bar. But the next time we had internet access, I looked the place up and was so disappointed we’d missed out on dining at the iconic Malibu locale! 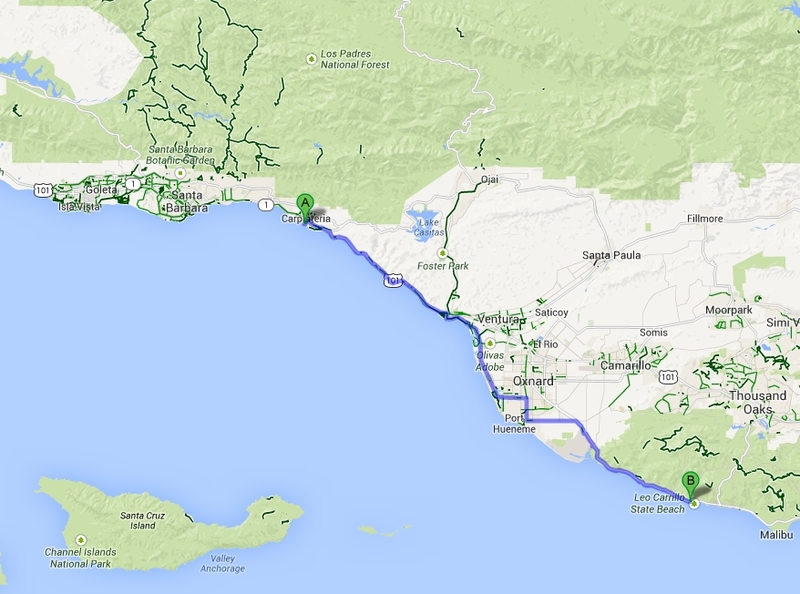 We pulled into Leo Carrillo, paid for our hiker/biker site and pedaled around the campground looking for it. Not sure what to expect after the previous night, we were pleasantly surprised to find a peaceful hiker/biker site nestled in the trees. It was so secluded, it almost felt like a wilderness area, not a busy campground near the surfing mayhem we’d experienced all day on the highway. Bonus that we spotted Danielle and Henry’s tent already set up in the site. We were all pleased we’d have pleasant company for the night as well! After a long and much-needed shower, my daughter and I wandered over to the camp store to see if they had anything we’d want. We found it stocked with premium beers and lots of ice cream choices. Danielle and Henry were sitting outside the store and stopped us before we entered. Henry told me Danielle had bought a 6 pack to share and to skip the beer and just buy ice cream for the kids. We spent the evening chatting with Henry and Danielle around the picnic table and sharing their beer. After such a stressful ride, it was so nice to relax and get to know our new friends. High: Leo Carrillo had a really nice hiker/biker site — with trees, privacy and quiet. It was almost wilderness camping on the outskirts of Malibu. And it had a little store with cold beer and ice cream! This entry was posted in bikes, Pacific Coast Bike Tour and tagged 2013, acapaccoast, beach, bike touring, bikes, CA, carfreedays, family bike touring, Family Cycling, kids, Pacific Coast Bike Tour, Pacific Coast Hwy, RV, surfing, tandem, tandem bike tour, two tandem bike tour, Ventura. Bookmark the permalink. We are v. familiar with that stretch of road. It can be frightening in a car! We stayed on a beach campground (not parked on the road like all those cheap devils in their big RVs). It was worth every penny for the seaside view from our “living room” window. It was also out of season so much quieter except for the college kids who played their stereo full blast at 2 am! Interesting post. Loved the story about your father and the F4. Thanks for the comment! I checked out your blog, traveling seems like an excellent way to figure out where you want to live. We’re not planning to move, but did ask ourselves along the journey if we thought we could live in certain towns. I now know I don’t want to live in CA! I’m glad you liked the post and the story about my dad. He has some good ones! My uncle played football for the Oakland Raiders in the 60s, one of my dads best stories is about flying over Oakland Raiders practice in his jet! Seems like you need to pump your Dad for all his stories. They’d made a good blog by themselves! Sometimes the most exotic things are close to home (thinking the hundreds of RVs here), aren’t they? Thanks so much for these posts — they make riveting reads, even though I know you are back. Thanks Michele! We’re slowly finishing the blog updates. I decided it didn’t matter that updates aren’t live! Have fun on your family bike camping trip! oh, now that brings back memories! I surfed county line and leo carillo breaks regularly. Ate at the Net a few times and climbed Yuerba Beuna blvd more times than I can count. Good times. To be honest, you didn’t miss much at the Net. Lots of fried food. Ok. on 2nd thought, nothing would probably taste better after 50 miles in the saddle. Learning/trying to surf is on my life list. I better do that before I get too old! Henry and Danielle named a few movies that were filmed at that beach — Gidget, Point Break, The Karate Kid and Grease! I’m bummed we didn’t even go to the beach…. And I should have forced the kid to try the Net. Greasy food after 50 miles is the best!